Luxurious 2 storey offices all interiors in hardwood Coryton Cardiff. Luxurious 3 storey offices all interiors in hardwood Coryton Cardiff. 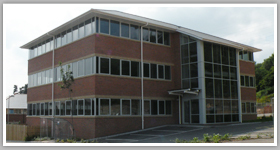 Modern 2 storey office blocks in Brecon court Cwmbran. A development of 6 large 2-storey office blocks, Charnwood Park Nantgarw. Artist impression, A development of five large 2-storey office blocks in Bridgend. A purpose built medical centre, surgery and pharmacy in Llanrhymney Cardiff.